In fourth pAsuram, parAnkuSa nAyaki‘s friend says “What is the use of offering different coloured ric varieties to dhEvathAs who are abundant with rajO guNam (passion) and thamO guNam (ignorance), based on the words of the kattuvichchi (psychic reader) who can speak mischievously? If you can engage in the divine nAma sankIrthanam [chanting the divine names] of sarvESvara who is the friend in need, you can redeem her”. Fourth pAsuram. parAnkuSa nAyaki‘s friend says “If you give up the repeated chattering of this kattuvichchi (psychic reader) who speaks whatever comes to her mind, and if you can recite the divine names of sarvESvara who is a friend in need, you will have her alive”. karunjORum maRRaich chenjOrum kaLan izhaiththen payan? en payan – what is the use? peRudhir – will have her alive. Believing something which is not a remedy to be the remedy, believing the words of the deceitful one [psychic reader] who cannot be said to be “from this place, of this nature” and one who keeps speaking in a flattering way, you all are placing the black rice and red rice which is different from the black rice in front of those other dhEvathAs – what is the use of this? If you can recite the divine name of para dhEvathA (supreme lord) who himself consumed all worlds at once to protect and spat them out again, you will have this distinguished parAnkuSa nAyaki alive. marundhAgum enRu – Should one who does not have a strict diet claim to be on diet? “marundhAm” – as if it is medicine. angu Or – Saying that “some one is there” with disregard for that person. mAya valavai sol koNdu – One who deceitfully speaks whatever she thinks about. Listening to the words of such person. nIr – What a shame for you who are qualified to hear from those who are sAthvika (goodness personified), honest persons who only speak about bhagavath vishayam. nIr – You who realize the value of the food remnants of sAthvika SrIvaishNavas as said in thirumAlai 41 “pOnagam seydha sEdam tharuvarEl punidham” (if a SrIvaishNava gives his food remnants, that will be very purifying); you who cannot touch anything but sAthvika annam (prasAdham). karum sORum … – thAmasa food and rAjasa food which is close [in quality] to that thAmasa food. kaLan izhaiththu en payan – kaLan – field, izhaikkai – offering. That is, the places where kshudhra dhEvathAs (petty deities) reside such as four way junctions, izhaiththu – offering with the regulations ordained for such dhEvathAs. What is the use of placing rAjasa and thAmasa food as per the ordained regulations for those rAjasa and thAmasa deities in their places of worship? Implies that there is no benefit; it will end with destruction only. Only if one can be saved from the total deluge by any one other than sarvESvara who is sarva rakshaka (protector of all), she (parAnkuSa nAyaki) can be protected with the help of petty deities. When asked “If there is no benefit [in doing what we are doing], you tell us what you consider as the means to get the benefit” and parAnkuSa nAyaki’s friend says “If you will follow my suggestion, I will only tell you one name [to recite]”. orungAgavE – You approach the one who voluntarily protects without any restriction, even if he is not worshipped with offerings. Even when no one is praying [for protection], he will come and protect considering the danger as the only reason. ulagEzhum – That too, instead of differentiating between devotees and others, he will place everyone in his divine stomach and protect them, and will release them out after the deluge. 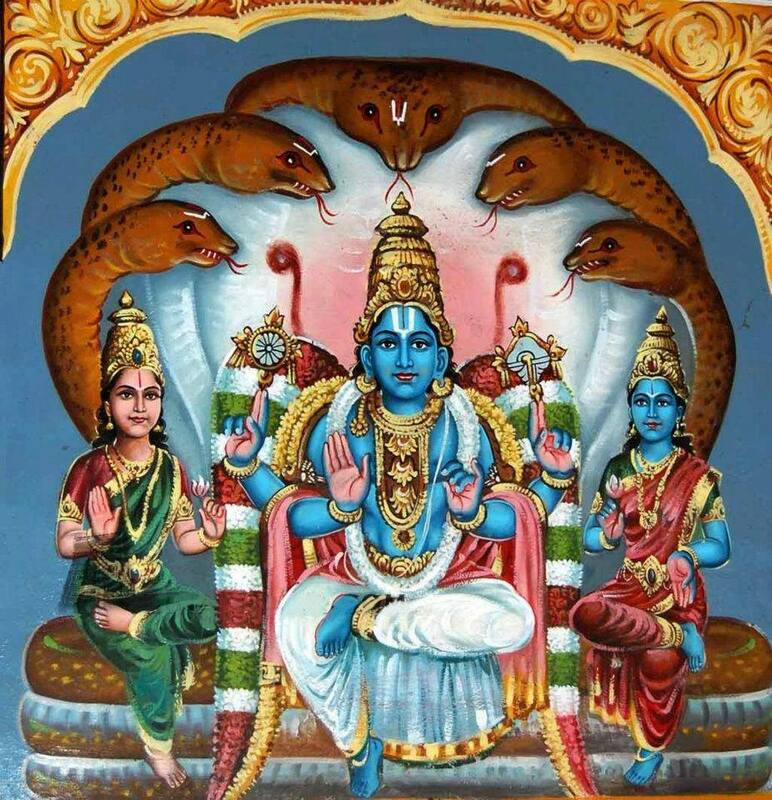 perum dhEvan – para dhEvathA (supreme deity). Since he is the protector of all, he is the supreme lord; he is the protector for those who are suffering; even though he did not manifest himself previously, when there is imminent danger, he will appear and protect. Due to his such nature, he is svArAdhakan (easily worshippable); unlike the dhEvathAs (deities) you worship who are difficult to worship due to saying “attadhozhiyach chuttadhu kodu vA” [In the incident where rudhra appears as a mendicant, goes to his devotee’s place and asks to kill and cook a young boy, and after eating the body of the boy, he asks for the head too – finally, he brings back the child to life being pleased with his devotees faith]. emperumAn, while protecting his devotees, only expects aprathishEdham (non rejection) which is a hint for the devotee’s AnukUlya (favourable nature) [towards emperumAn]. ulagEzhum … – That lord who finished [protected] during that praLayam (deluge) is the one who can finish my praLayam (suffering). How can we take shelter of the kshudhra dhEvathAs (petty deities) who also suffer along with us during the deluge? Should we not take shelter of the sarva rakshaka? pEr sollagiRkil – If you can recite the divine names. If it is so effortless [like just reciting the divine names], would the benefit also be limited/small? ivaLaip peRudhirE – There [with respect to petty deities], whatever may be the effort, the benefit is small/nothing; here, the effort is just reciting the divine names, and the benefit is great in redeeming her. If you recite the names, you will get her, otherwise you will lose her. This entry was posted in thiruvAimozhi, thiruvAimozhi 4th centum on March 4, 2017 by Sarathy Thothathri.